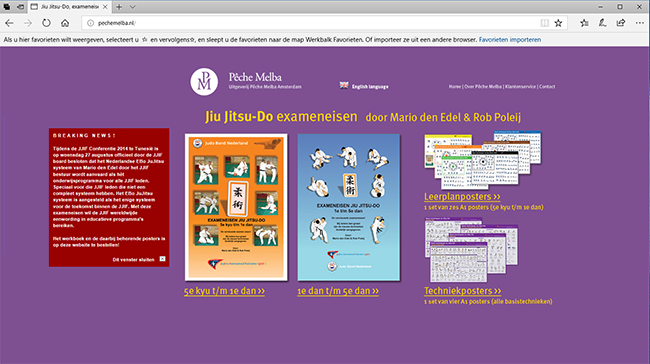 Publishing company Pêche Melba mainly provides publications in the field of martial arts, and in particular Ju-Jitsu. The publisher (himself an enthusiast Ju-Jitsuka) aims to promote the Ju-Jitsu as widely as possible to the largest possible group of interested people (coaches, athletes and enthusiasts). The Dutch edition “Ju Jitsu-Do, Examination requirements 5th kyu till 1st dan” has an English, Danish, Spanish and soon French translation. In addition, there is also the follow-up: “Jiu Jitsu-Do, Examination requirements 1st dan till 5th than” available and also special technique posters.